Posted Thursday, July 25th, 2013 by Steve Leigh. Chances are, you’ve had this experience: You shop for a printer that is in your price range, or even below your price range, get it home, and start printing. After a while, the cartridges run dry and need to be replaced, and only THEN do you realize that the cartridges for your bargain printer are not such a bargain. So how can you avoid this mistake in the future? By paying attention to the cost per page of the ink or toner supplies for the printer you are researching. The cost per page of ink and toner doesn’t tell the whole story, of course, as you will need paper and possibly maintenance parts like a printing drum, but it provides a great way to compare the cost of supplies from one printer to the next, and make a more informed buying decision. The cost of a replacement cartridge. The average page yield of the cartridge. Most reputable sellers will provide the average page yield of the supplies they sell. Here is an example from the InkTechnologies.com website for the Samsung ML-2850 toner cartridges. You can see the page yield is 3,000 and the price is $35 before any volume discounts. All we have to do is divide the page yield by the price, and we have the cost per page. Round that to .012 and you will pay approximately 1.2 cents per page! Now, where the cost per page is most useful is in comparing different printers to see which will be more affordable on a long-term basis. Let’s compare our Samsung model to the Dell 1130 toner cartridge below. Round that to .015 and we have 1.5 cents per page, which makes the Dell model’s supplies more expensive, and ultimately means you will spend more on supplies in the long run. As mentioned before, there are several other factors to consider. Color models, for example, use several toner cartridges or inkjet cartridges instead of just one, though you can still compare each color individually, or take them all as a whole. The cost per page also doesn’t calculate paper costs, energy costs, or other details. As a comparison method, however, the cost per page is still very valuable in helping you choose the most cost-effective printer when it comes to supplies. You should also note that the estimated page yield is only an average, and may not relate to your actual average cost per page if you tend to print a lot of photos and heavy graphics. For a more detailed method for tracking your printer’s actual page yield, see our article on using the Printer Statistics Page. The cost of ink and toner supplies is an important factor to consider when purchasing a new printer, but it often gets ignored in favor of more “flashy” features like Wi-Fi support or mobile printing. 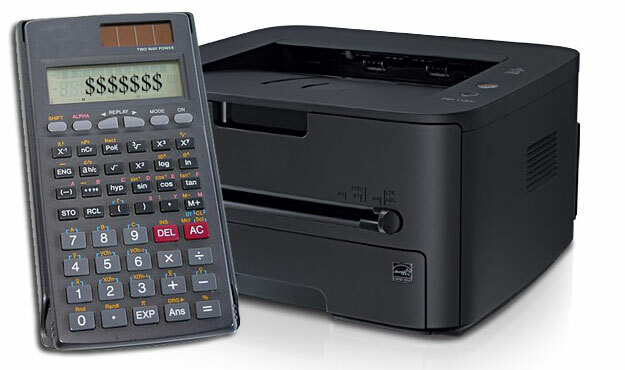 The next time you are shopping for a printer, use the search tool at InkTechnologies.com to look up your potential purchases and calculate the cost per page of supplies. Then you will have a better idea what you are in for when it comes time for replacement.